Bus from Alor Setar to Ipoh is very convenient and cost-effective mode of transportation to travel between the two famous cities in Malaysia. Bus remains competitive for this route Alor Setar to Ipoh because of its frequent bus schedule and budget bus fare. ETS Train emerges as the strong challenge to bus for transport service from Alor Setar to Ipoh. ETS train is fast, punctual and comfortable. Therefore, some passengers have changed to take ETS train from Alor Setar to Ipoh. However, bus service still plays major role in this route Alor Setar to Ipoh. That is because bus service supplies frequent bus schedule from morning 8:45am till night 11:45pm at affordable fare. Both frequent bus schedule and cheaper bus fare make many passengers prefer taking bus to taking ETS train. Sri Maju, Kesatuan Express and Trans MVS Express are few bus company supplying bus from Alor Setar to Ipoh. Sri Maju is the dominant player in this route service by having up to 8 daily departure while both Kesatuan Express and Trans MVS Express each only provide 1 daily departure. The duration from Alor Setar to Ipoh usually takes on average 4 hours by bus. The arrival time is depending on the road traffic and weather condition on the departure day. Washroom break will be given during the journey. The bus fare from Alor Setar to Ipoh costs in a range of RM 25.00 to RM 28.00, except for Trans MVS costing at RM 55.00. The departure point in Alor Setar is located at Alor Setar Bus Terminal. The arrival point in Ipoh is located at Ipoh Aman Jaya Bus Terminal. Passenger arriving at Ipoh Aman Jaya Bus Terminal could take shuttle bus from there to Ipoh town area. 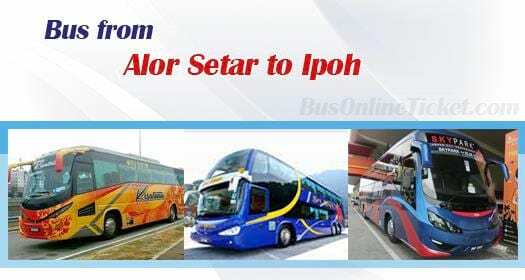 Passengers who are planning to take bus from Alor Setar to Ipoh can book your ticket at BusOnlineTicket.com. By booking with BusOnlineTicket.com, you can save the hassle of queuing at the ticket counter in bus terminal.